Denny Hamlin and the FedEx Racing team played the fuel strategy game to perfection last Sunday at Kansas Speedway, recording a third-place finish. Crew chief Mike Ford called Hamlin to pit road under caution with 111 laps to go — giving up third position — to make adjustments on the #11 Toyota and get inside the fuel window to make it the distance with just one more stop. Falling back to 21st in the running order, Hamlin charged through the field to get back up near the top-10. As the race went green and the front-running cars were forced to pit road for fuel with around 10 laps to go, Hamlin moved up to second. Leader Brad Keselowski was able to stretch his fuel to the end for the victory, and Hamlin’s tight race car wouldn’t allow him to hold off Dale Earnhardt Jr. for runner-up. The third-place result marks Hamlin’s fifth top-10 finish of the 2011 season, and moved him up one spot to 11th in the NASCAR point standings following Kansas. 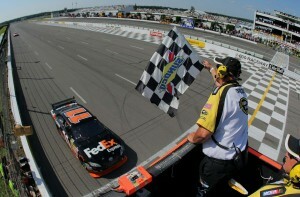 Starting with Talladega (April 17) six races ago, Hamlin and the FedEx team have moved up nine spots in the points. Hamlin is making his 11th Cup Series start at Pocono (Pa.) Raceway on Sunday and the 201st of his career. Arguably Hamlin’s best track, the 30-year-old driver has four wins and eight top-six finishes in 10 starts at the 2.5-mile ‘Tricky Triangle.’ Hamlin is the defending race winner at Pocono, starting fifth and leading 88 laps in June 2010 en route to victory lane, holding off a fury of challengers on late-race restarts for the win. He also recorded his first career Cup Series win at the track, when he swept both Pocono races during his rookie season in 2006. Hamlin won his third race at Pocono in August 2009. In the Series’ most recent trip to the track in August 2010, Hamlin guided the #11 FedEx Toyota to a fifth-place result. Hamlin has led a total of 498 laps (of 1,910 completed) at Pocono, and his 8.2 average finishing position is the best among active drivers with at least three starts. The FedEx Ground Florida district will see its “FLDA” code letters on the b-post of the #11 FedEx Ground Toyota for the second time in 2011 after continuing to lead the way in package care. What do you think has helped this team improve over the last few weeks? What is it about Pocono that suits your driving style?